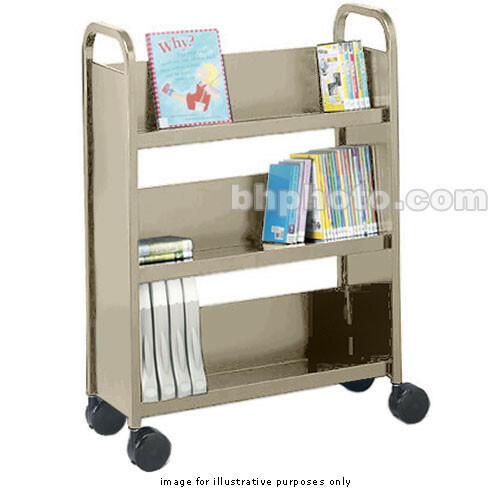 The Bretford B00317-PB Contemporary Book & Utility Truck is a single-sided book truck with 3 slanted shelves that provide ample space for books, binders, audio or video tapes, and reference materials. This mobile utility truck has a convenient design that allows the unit to be stored against the wall or a desk. It features smooth, rounded handles that are built into the end panels and 4" twin wheel casters (2 locking) for quiet, easy mobility. The durable, all-steel B00317-PB is finished in environmentally-friendly Putty Beige powder paint. Box Dimensions (LxWxH) 43.0 x 19.25 x 16.0"